In this thought-provoking book, Open Briefing’s Executive Director, Chris Abbott, takes a close look at 21 key speeches that have shaped the world today. 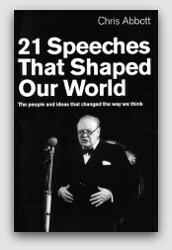 21 speeches that shaped our world was published in paperback on 7 June 2012. It was first published in hardback and for Kindle in August 2010. It is available in English (Rider Books), Korean (Eiji 21), Japanese (Eiji Press), Russian (Astrel) and Portuguese (Bertrand Editoria). More information is available at www.21speeches.com.